Our review copy of Friday was generously supplied by 2F-Spiele. Thanks a lot, you guys rock! The review is based on the German edition “Freitag”. Solo games are a very small niche of boardgames. There are many games that can be played solo, but the number of games that can only be played alone is small indeed. They are not hugely popular with players as they lack the social aspect of games – if you disregard comparing your scores – and that makes them unattractive to game designers. As always, there is no rule without exception, and sometimes a designer wakes up with an idea that thematically and mechanically demands to be made into a solo game. If that designer happens to be Friedemann Friese, best-known for the very successful Power Grid, that sparks my interest. Friday is one of Friedemann’s 2011 Essen releases – the other one is Power Grid: The First Sparks which we will also review soon – and is the newest output of his Friday Project. 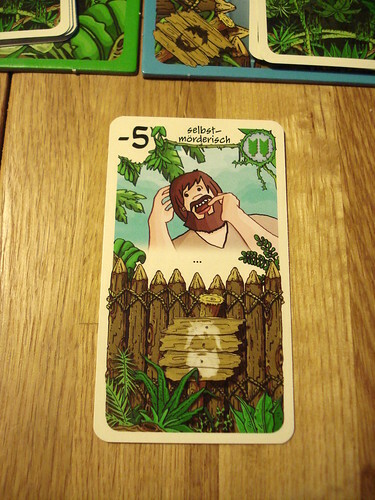 Friedemann Friese’s Friday Project is a project he started at the 2008 Essen fair – Friday, obviously – to work on a game every Friday for the next five years and release it under the name Friday at Essen 2013. But only on Friday. When making that pledge, F.F. seriously underestimated his own productivity and the game called Friday was two years early and was already preceded by Black Friday, another result of the Friday project. The Friday in Friday – if I use this word just a few more times it will start sounding funny – is Robinson Cruesoe’s faithful indigenous companion Friday whose role you take in Friday. You’re living lonely but happily on your little island when one day a guy called Robinson is washed up on your shore – some liberties with the source material were taken.Your goal in the game is to train Robinson in basic survival on the island, make him stronger, faster and smarter so he will be able to defeat two pirate ships in the end and leave the island so you can finally return to eventless days of fishing and listening to music on your coconut radio. The castaway Robinson is a deck of cards. I don’t mean this as a new expression to mean “incompetent fool” – although you are welcome to use it with that meaning – he is literally a deck of cards. And so is your island. Each turn, you turn two cards from the island deck – appropriately called danger cards – and choose one for Robinson to fight. How is he ever going to learn if you don’t confront him with life-threatening dangers, right? Danger cards have two numbers you are interested in: the threat value at the current level (green, yellow and red) and the number of Robinson cards you may use. After choosing the danger card, you start turning Robinson cards; each Robinson card has a strength value and when the sum of your cards at least matches the danger card’s threat Robinson has overcome that particular danger. So far, so random. 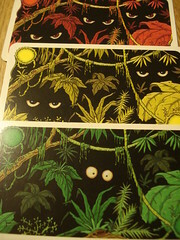 If you didn’t defeat the threat with the number of cards you were allowed to use – the more common case with the starting deck and all its zeros and minus ones – you may now pay one of Robinson’s twenty health points for each additional card you wish to draw, or you may simply advise Robinson to give up. Giving up is painful, Robinson loses one point of health for each point you lack to defeat the threat, but it’s the most important decision in the game. Admitting defeat allows you to streamline your Robinson deck, for each point of health lost you may remove one card from the Robinson cards you just played. Losing a couple of fights to remove all those 0 and -1 cards is an investment in the future. The Man Friday is a strong believer in learning by pain. Nevertheless, at some point you will also win a fight. It’s hard to believe, given the sheer incompetence of Robinson, but you will. Winning a fight also teaches you a valuable lesson: you may put the danger card into your Robinson deck. All danger cards double as Robinson cards, with a strength relative to their threat level and often with useful special abilities that you may use once per fight. Some allow you to draw additional cards for free, others let you double a cards strength, let you exchange a card or give you life back. Losing a fight lets you get rid of your weaknesses, but only winning a fight leads to real improvement. Winning the occasional fight also makes sure your Robinson deck doesn’t become too thin and you don’t have to shuffle it too often. Shuffling your Robinson deck is bad: each time you do, you add a Klutz card to it. Those cards have a high potential to make you unhappy: their strength goes down to -5 and they may even have embarrassing side effects like turning your highest card into a zero. 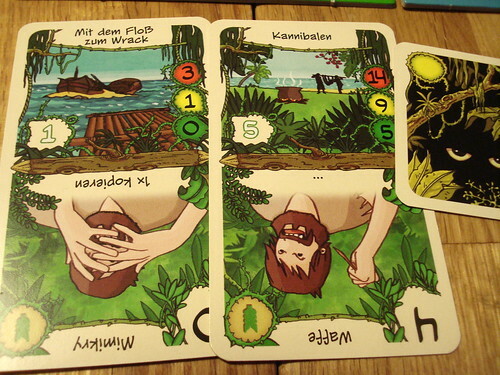 As the game progresses, you lead Robinson into the more dangerous parts of the island: when the deck of danger cards is used up and reshuffled, the difficulty advances first from green to yellow, then to red, each time increasing the threat level of all danger cards. When Robinson has proven he can handle the worst the island has to offer – when the danger deck is used up at red difficulty – it’s time for his final test: the fight against the pirates. Two pirate ships were drawn at the start of the game, and now it’s time to fight them. They have a much higher threat value than normal danger cards, and some come with nasty special abilities. These pirates are tough, but if you managed to survive to this point you have a good chance to defeat them. And after you do, you might as well play again at a higher level of difficulty, giving you a less favourable starting position. As is sufficiently clear from the description, Friday is a deck-building game. Robinson is the deck, and you build him. The genre is not famous for its high amount of interaction, making it a good starting point for developing a solo game. And as deck-building games go, Friday comes with some innovation: the double use of cards as danger and Robinson cards introduces a small risk-taking element as you will want to conquer the more powerful card but you don’t know which cards are coming up in your deck. The trade-off to occasionally take a beating in order to clear bad cards from your deck is another good one, and I see them both reused in multiplayer games in the near future. Those games can then also avoid one downside that comes up in Friday: most decisions are tactical, you don’t really need much strategy. Also, even with the randomness of which cards come up, after a while all games tend to feel very similar, you’re not really doing anything different. Especially the pirate ships could have been more different than they are, except for two of the ones with special abilities it doesn’t really influence your game which one you get. But that’s a common problem in solo games and while Friday doesn’t entirely avoid it, there are four levels of difficulty that will keep you busy for a while before you beat them all. If you are interested in solo games at all, Friday is worth your while, it comes with a fun theme, looks good and keeps you entertained for some time. However, it will not serve you well in some situations where you really want a solo game: on the train or on the plane. The box is nice and small, easy to take along, but the game does require some space: two decks of cards with their discard piles, the health tokens and a potentially long line of cards for the current fight, some of which you might want to turn sideways to show that you already used their abilities. I’m not saying it’s impossible on the table in a train or plane, but it does require some juggling and creative rearrangement if you’re travelling economy. Friday is a solo game better suited for home or those long evening at the hotel when you’re on a business trip.